Bring your family to the Cherry Grove section of North Myrtle Beach, South Carolina for a fantastic beach vacation at an oceanfront North Myrtle Beach resort. Sea Cloisters I is an oceanfront resort comprised of several three-story buildings that cluster around an oceanfront swimming pool. This North Myrtle Beach resort is near the Cherry Grove Fishing Pier and just down the street from beach clubs that feature shag dancing and beach music. Each of the North Myrtle Beach condominiums at Sea Cloisters I have a balcony that offers views of the Atlantic Ocean. Having views of the beautiful Atlantic Ocean is a must for any North Myrtle Beach vacation. 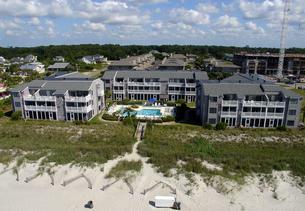 The white sandy beaches and majestic ocean are the primary lures to the North Myrtle Beach area for family vacations. So having them both within sight while you relax in your North Myrtle Beach condominium is quite nice. When you spend your North Myrtle Beach vacation at Sea Cloisters I your family will be near the sparkling blue swimming pool regardless of which North Myrtle Beach rental you choose. The swimming pool and its surrounding sun deck are right on the oceanfront. It is a real pleasure to lounge poolside at this North Myrtle Beach resort. You can really get rested up by the swimming pool. Just bring along the latest bestseller or your favorite music and chill out. Choose a spacious North Myrtle Beach condo rental at Sea Cloisters I. There are three-bedroom North Myrtle Beach vacation rentals at this North Myrtle Beach resort. You will definitely be happy when you spend a North Myrtle Beach vacation at Sea Cloisters I. The three-bedroom North Myrtle Beach rentals have two full baths and can sleep up to 10 people. The floor plan of these North Myrtle Beach rentals is such that there is a great room which includes a kitchen, dining area and living room. The kitchen in each of these condos in North Myrtle Beach, South Carolina is well equipped. There is plenty of counter space in these kitchens as well as full-size appliances, including a dishwasher. Make a hot meal during your North Myrtle Beach vacation or just keep some cereal on hand for a quick breakfast in the morning. There is a microwave so you might want to have some popcorn in the cupboard during your stay at Sea Cloisters I. The kitchen overlooks the dining area, which is as nice for playing board games and reading the newspaper as it is for eating lunch. The living room in these North Myrtle Beach rentals is quite comfortable and sunny. Make yourself at home in the great room of your private and fabulously furnished North Myrtle Beach condominium rental at Sea Cloisters I.
Elliott Beach Rentals is not affiliated with onsite management or the HOA of Sea Cloisters I.